The Export Project window lets you export a storyboard project to a Final Cut Pro 6, so you can edit it and then import the changes back into your Storyboard Pro project—see About Conformation. Keeps layers on separate images instead of flattening each panel’s layers into one flat image file. Includes the camera frame’s black border. Prevents image files from being different sizes depending on the camera frames and movements on each panel. To avoid the image from being pixelated when the camera is zoomed in, the image must be rendered larger. The area where the camera is the most zoomed in must be the same size as the project resolution. This means that the rest of the image has to be exported in proportion to the smallest area. 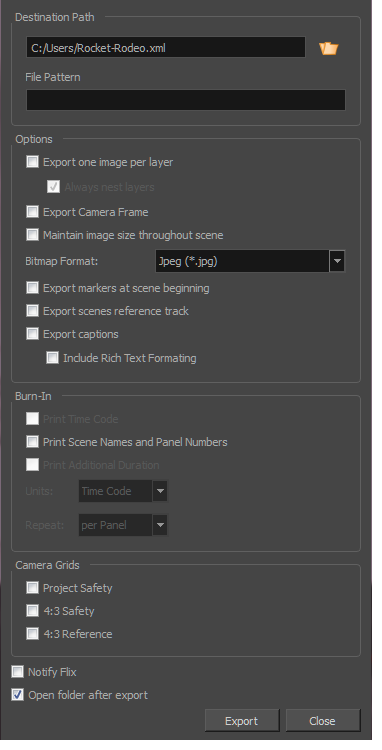 Lets you select a bitmap image format:Targa (*.tga)Photoshop (*.psd)Portable Network Graphics (*.png)Jpeg (*.jpg). Places a chapter marker at the beginning of each scene. These markers are used to find the in point of each scene when conforming from Final Cut Pro to Harmony. The marker are named "Scene: NAME_OF_SCENE" and have a unique scene ID and chapter marker as their comment. Generates .png images with the scene named burned in. When exporting to Final Cut Pro, this option must be enabled. The track will be used by Harmony when conforming the XML from Final Cut Pro to find the scene in the XML. Includes all captions in XML when exporting, so you can see it as a comment (metadata) in Final Cut Pro or Premiere. You can edit the data of the caption and conform back to Storyboard Pro. Include Rich Text Formatting: Exports captions in RTF format. Deselect this option to export captions as plain, readable text. When new XML data is exported, sends Flix a message so it will automatically update its asset database. Note that Flix must be installed on your computer.